The atmosphere was amazing when participants "took it seriously". 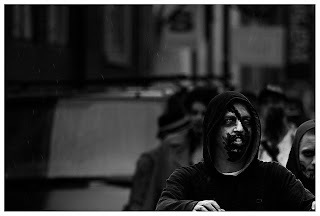 At one point I was stuck on top of a large garbage container, Zombies were flocking around me "trying" to pull me down (knowing that I had my camera and was situated quite dangerously - so they weren't really placing me in any danger... thank god!) my good friend and colleague Mikkel, who was also posing as a zombie, jumped the container and started eating me. It was amazing! To bad I had a 70-300mm cheap Sigma on at the moment, so nothing useful came out of it. Dang. One (of many) zombie "taking it seriously".